ASUS PC Link is a free and official application for use on ASUS mobile handheld devices that run Android. The program allows you to mirror your mobile phone's screen on your PC. 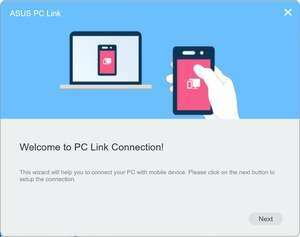 After connecting to your device with ASUS PC Link, you can use your mouse and keyboard to complete tasks on the phone. All that's required is a USB cable. Version 3.0.22.1029 is a freeware program which does not have restrictions and it's free so it doesn't cost anything. For security reasons, you should also check out the ASUS PC Link download at LO4D.com which includes virus and malware tests. Additional screenshots of this application download may be available, too.